The video is what Joan Morais Naturals and I am all about. It is our mission to provide education and assist anyone interested in becoming a product formulator and/or manufacturer. We specialize in giving you the information needed including formulas and tools for a platform to launch you to success. We are here to help you. Are you always changing up recipes and know you can make them better? If so, you are probably a product formulator. Being a product formulator for natural body, hair and skin care products is one of the most rewarding and fun careers. The job of a product formulator is so diverse. I formulate all kinds of hair care products, body and skin care products and candles and room mists. You can choose what to specialize in. I firmly believe anyone with a profession of hair stylist, colorist, skin therapist, esthetician, massage therapist, holistic healer, dermatologist and others should all have their unique customized products for the body, hair and skin. Just like going to a restaurant with a fine chef, we expect to eat food with recipes developed by that chef, I believe this should extend to holistic professions for the well-being of the body and soul. We offer several online professional courses to assist you on the path to become a product formulator, developer and manufacturer. You can take the course on your own time; after your job, at night time, on weekends, whenever you have spare time. Before you know it you are on your way to doing what you love and having a career in it. This entry was posted in Inspiration and tagged Become a Product Formulator, Hair and Skin Care Products, job of a product formulator, product formulator for natural body on January 7, 2016 by Joan Morais. The Coalition for Consumer Information on Cosmetics’ (CCIC) Leaping Bunny Program administers a cruelty-free standard assuring that no animal testing is used in any phase of product development by the company, its laboratories, or suppliers. The internationally recognized Leaping Bunny Logo is displayed on packaging for consumer recognition. You can look for the above two logos on the packaging of products for assurance that you are supporting cruelty free companies. Do you manufacture and sell cosmetic, household or personal care products? If so, we encourage you to apply here to become Leaping Bunny certified. Once approved, your company will be listed on the Leaping Bunny online and published Compassionate Shopping Guide, also your company will be included in media and marketing opportunities by Leaping Bunny. Do you want to make a difference as a consumer? -Vow to not purchase products from companies that use animals as test subjects. You can show your commitment by signing the Pledge to Be Cruelty-Free here. -If you have a smart phone download the Leaping Bunny app. It is a great tool to have, it lists out the cruelty-free companies which you can click on each company name for a description and website. Or you can search by product type such as toothpaste and it will give you a list of cruelty-free toothpaste companies. -Speak out for animals, there are many creative ways to spread the word. You can follow Leaping Bunny on Facebook here to support and bring awareness to others. -Give your family and friends copies of the Compassionate Shopping Guide (request multiple copies by e-mailing info@leapingbunny.org). Where you put your dollar matters. We can make a change by not funding others to abuse our animals. Lets not fund the below experiences anymore now that we know. The below facts are taken from PETA.org. -In a violent experiment at the University of Pennsylvania, puppies were bred to have a degenerative eye disease that culminates in blindness. During the study, 3-week-old beagles had their eyes cut out and were killed. -Dogs are a favored species in toxicology studies. In these studies, large doses of a test substance (a pharmaceutical, industrial chemical, pesticide, or household product) are force-fed to animals or injected into their bodies, slowly poisoning them. -At Ohio State University, vivisector George Billman forced surgically manipulated dogs to run on a treadmill until they collapsed from a heart attack. The dogs were killed, and the damage to their heart tissue was studied. -22,000 cats are abused in U.S. laboratories every year—in addition to the tens of thousands who are killed and sold to schools for cruel and crude classroom dissections. -Rabbits are tormented in the Draize eye irritancy test, in which cosmetics, dish washing liquid, drain cleaner, and other substances are dripped into the animals’ eyes, often causing redness, swelling, discharge, ulceration, hemorrhaging, cloudiness, or blindness. The rabbits are killed after the experiment is over. -In skin corrosion tests, rabbits’ backs are shaved and corrosive chemicals are applied to their raw skin and left there for up to two weeks. These chemicals often burn the skin, leading to tissue damage. Rabbits are also given no pain relief during this excruciatingly painful test, and after the test is finished, they are killed. -In pharmaceutical tests, thick gavage tubes are forced up primates’ nostrils or down the animals’ throats so that experimental drugs can be pumped into their stomachs—even though the U.S. Food and Drug Administration reports that animal tests have an appalling 92 percent failure rate in predicting the safety and/or effectiveness of pharmaceuticals. Video footage taken by a whistleblower inside SNBL reveals the anguish and trauma that monkeys used in pharmaceutical tests endure. -Pigs are mutilated and killed in invasive and deadly surgical training exercises at universities and hospitals. In the exercises, holes are cut into the animals’ throats, needles are stabbed into their bones, and the tissue surrounding their hearts and organs is removed. These deadly and archaic exercises continue, even though modern and superior non-animal simulation methods that better prepare trainees to treat human patients exist. -At the University of Texas Medical Branch at Galveston (UTMB), pigs are subjected to third-degree burns on up to 40 percent of their bodies, with the open flame of a Bunsen burner or a scorching-hot metal rod. -More than 100 million mice and rats are killed in U.S. laboratories every year. They are abused in everything from toxicology tests (in which they are slowly poisoned to death) to painful burn experiments to psychological experiments that induce terror, anxiety, depression, and helplessness. Mice and rats are mammals with nervous systems similar to our own. It’s no secret that they feel pain, fear, loneliness, and joy just as we do. Learn more about animals used in experimentation here. Click here for the lists of companies that are and are not cruelty-free. To end on a light note. Below is a picture of activists rescuing beagle puppies from a breeder that was sending the puppies to a laboratory to be test subjects. So precious. This entry was posted in Beauty Without Cruelty, Body & Skin Care, Helpful Information, Inspiration and tagged beauty without cruelty, Beauty Without Cruelty Part 2, bunny logo, ccic, cosmetic testing, cruelty free, leaping bunny, peta on August 28, 2013 by Joan Morais. This is part 1 of our 3 part series on Beauty Without Cruelty. Hundreds of thousands of dogs, cats, rabbits, primates, mice and other animals are poisoned, blinded and killed every year for product tests for cosmetics, personal-care products, household cleaning products, etc. These product tests are not required by law, often produce inaccurate results and even if a product has blinded an animal it can still be marketed to us. Join us in not supporting companies that test on animals. To give you an idea of how main-stream animal testing is, check out the major brands below that still test on animals. Yes, this is just a small portion, there are many more, click here to view list. Click here to view the full list of the companies that do not support testing on animals. Even better- the companies on the list with a V next to the company name indicates they do not use any animal by-products in their products. Just because the company does not test on animals does not mean they do not contain parts of animals in their products. To learn the 101 on animal testing click here. This entry was posted in Beauty Without Cruelty, Body & Skin Care, Helpful Information, Inspiration and tagged animal cruelty, animal testing, avon, beauty, beauty without cruelty, cosmetic testing, cosmetics, estee lauder, leaping bunny, mary kay, peta, vegan on August 21, 2013 by Joan Morais. 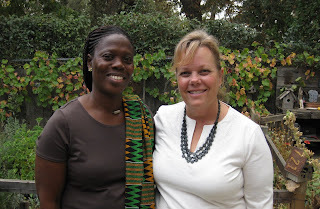 At my October 2008 course on Making Natural Skin & Body Care Products, I had the pleasure of meeting Comfort Adjahoe. She came all the way from Ghana, Africa to attend the course. The irony of this is, I have wanted to go to Ghana, Africa since 2004 when I started using shea butter from Ghana (pronounced ganna, not gonna like I used to say) in my products. In my classes I teach about the importance of buying fair trade ingredients especially shea butter. Buying fair trade shea butter pays the women fairly for their hard work. I wanted to visit Ghana to meet these women and watch how they make shea butter starting with the karite tree. Instead, I was fortunate to have them come to me via Comfort. Comfort brought a DVD with slides of the women making the shea butter. She also brought shea butter, lip balms and beautiful beaded jewelry (I am wearing the necklace) in the photo. I love and treasure everything she gave me especially the shea butter in the gourd with a decorative bead and wood burned design and the clay pot with decorations on the side. Comfort is the chief executive officer of her business, Ele Agbe and Nasheaba Cosmetics. Ele Agbe plays an active role in Ghana employing over 50 young people, mostly women. Her products are sold in the USA and worldwide. 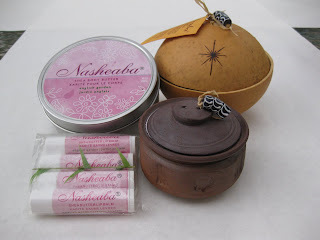 In December, when I was at the store Baksheesh in Sonoma, California, I saw a clay pot of shea butter from her company Nasheaba. It brought tears to my eyes to think how connected we all are and how fortunate I was to meet Comfort and spend time with her. She is beautiful, intelligent, strong and an entrepreneur. I am sure it has not been easy for her and yet her powerful will keeps her going past any adversities. Comfort’s company sells handcrafted beaded jewelry, home decor, shea butter, soaps and body care products. Target and TJ Maxx are some of the purchasers of the home decor. Ten Thousand Villages sells the shea butter in the clay pot. Shea butter comes from the fat of the nuts of the Karite Tree mainly from West and Central Africa. The shea butter I use is from Ghana prepared by the women elders in the traditional way. The nuts are cracked, grilled, pounded and boiled in water. The oil is separated out of the water and placed into gourds to solidify. The process is all done by hand. This trade helps to provide schools and clean water for the villages. The best shea butter is unrefined, non-deodorized and unbleached as these processes destroy the natural vitamins and minerals. Shea butter is one of the best butters for skin care high in Vitamins A, E and F. It comes is in solid form with a soft texture. Used for centuries in Africa to moisturize, soften and smooth skin. It provides a water resistant film on the skin. Use for aged, cracked and damaged skin, stretch marks, sunburn, before and after sun exposure, dermatitis, eczema, rashes, circulation, prevention of aging-reduces inflammation and wrinkles. Shea butter is a natural sunscreen. This entry was posted in Inspiration and tagged shea butter on March 23, 2009 by Joan Morais.